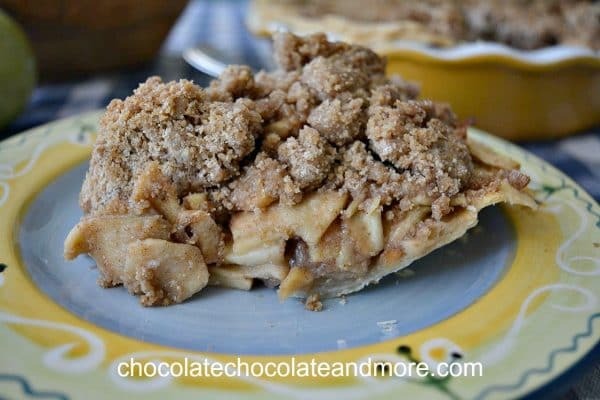 Apple Crumb Pie - Chocolate Chocolate and More! 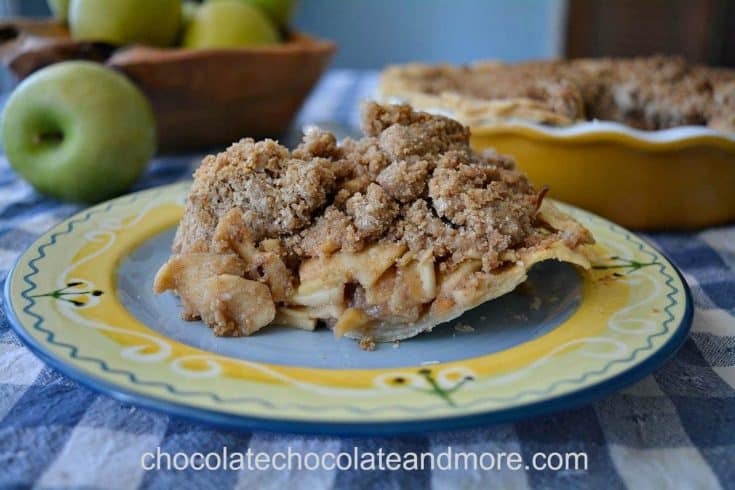 Apple Crumb Pie – flaky crust, tangy apples and mounds of sweet crumb topping. Perfect for your fall table or any time you have some fresh apples! This is one of the recipes Joan left for us. Thanksgiving was her favorite holiday. She loved cooking a feast for her family and having that special time of celebration, football, and board games. When we were kids visiting our grandparents, we’d always have football on the television as we played card games after Thanksgiving dinner (lunch for most people). Uno was one of our family favorites. There was always plenty of food to nibble on all day and pie was so easy to eat while playing games. I love apple pie and always make one for Thanksgiving. I always make a two crust pie so I like to make my filling on the stove first. If you cook the apples before filling the pie, it will stay full as it bakes. Apple crumb pie is much easier than mine (no fiddling with the top crust) and the topping goes so well with the apples. The topping does add more sugar so make sure your apples are tart and don’t skip the lemon juice. Another great thing about Apple Crumb pie is it can be made ahead and frozen before cooking. If you have a pyrex or aluminum pie pan, you can pop it straight into the oven. If not, thaw it in the refrigerator for a day before cooking. I love a hot apple pie for Thanksgiving dessert so I usually pop mine into the oven just as we all sit down to eat. Apple crumb pie is amazing hot but it’s also great cold so you can enjoy it after the meal (if there’s any left). Don’t forget to enter our DreamFarm giveaway. It ends tomorrow and there are some fun gadgets for Thanksgiving. We’ll have a DreamFarm baking gadgets giveaway on Wednesday. Prepare pie crust by blending flour, salt, butter and water just until dough forms. This can be done in a food processor, mixer or with a pastry blender. Form dough into a disk and wrap in plastic wrap. Refrigerate for 1 hour to firm. Roll pie crust to 2 inches wider in diameter than your pie plate. Place crust in pie plate and fill with filling. Prepare topping. Using a pastry blender, combine all ingredients until crumbly. Prepare filling, Coat apples with lemon juice, drain off any excess juice. Combine sugar, flour and cinnamon, then toss apple slices in dry mixture to coat. Beat egg white until frothy and then coat the inside of the pie crust with the beaten egg white. Place filling in prepared pie crust. Break cold butter into small pieces and distribute on top of the filling. Top with crumb coating. Bake in a preheated 350 degree oven for 45 minutes. Pie is done when crumb coating and crust both just begin to brown. Let pie cool for 45 minnutes before serving or cool completely. 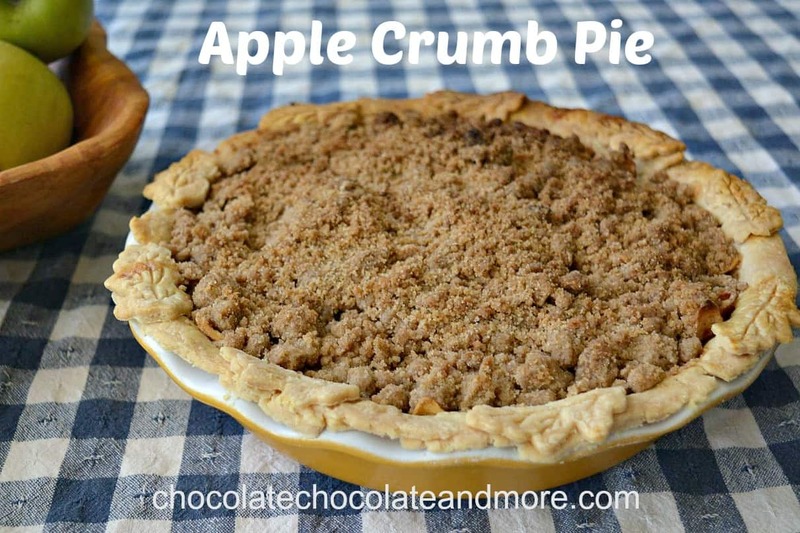 Apple pie is my absolute favorite type of pie, and the more crumbs, the better! (I used to ask my mom to make “crumbly” apple pie when I was younger.) Loving this recipe, and it’s great that it brings back so many wonderful memories for your family. looks good, but if we could still feel the apple? I have made apple pie many times before, but I have never used lemon juice in the filling before. The lemon juice brings out the tartness in the apples and makes it a little more juicy. I hope you enjoy this pie! I made this for Thanksgiving and it was delicious. Thank you for the recipe! Glad you liked it Tara!